Another day, another spectacular tower in Dubai: The Michael Schumacher World Champion Tower, a curvy building "inspired by the geometrical order of a snowflake and the aerodynamics of a Formula 1", will not only appear in Dubai but in six other cities around the world. According to the architects—who worked in Beijing's Water Cube—the design will allow for an easy construction process and an efficient use of energy, all while making the building change its look through the day. The building features an iconic silhouette and a facade characterised by vertical slots with private balconies. 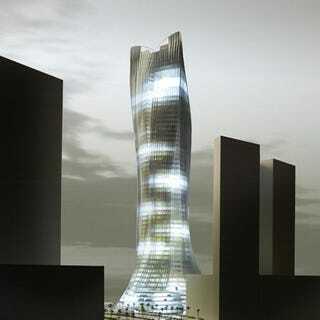 A series of reflective fins generates a vertical dynamic and gives the building a constantly changing appearance. The fins track the sun, control the solar shading and dissolve the rationality of the plan into a continuously evolving building volume. The facade’s continuous surface enables curvature with a lot of repetition and the potential for standardisation in the building process. State-of-theart engineering and innovative materials will be used to achieve a fully sustainable performance.